We know you love us for our easy-to-love, everyday Californian wines, but just now and again we like to out-do ourselves. Grapes from across our beautiful state of Califonia will always be JaM’s first love, but for the next two weeks only, we’re releasing a tiny amount of JaM made with world-famous Napa Valley grapes to everyone on our mailing list. It’s a treat that feels like getting a second birthday half way through the year! JaM Cellars started in Napa and hopefully you’ve visited our wine and music studio here in downtown Napa? (If you haven’t, please come soon!) Our little microclimate here in Napa makes for extra-complex, structured and rich wines, but of course we kept the big, bold, berry flavors that you love. There’s not much JaM Cab Napa to go around and you won’t see it on store shelves. This wine is typically just for members of MyJaMClub and guests at JaM Cellars Napa, but for the next two weeks we’re making this tiny amount available to all JaMFans! Plus we’ll save a little bit for you to enjoy at BottleRock Napa Valley presented by JaM Cellars. Well, it’d be such a shame not to! Can’t wait til BottleRock? Come to Napa for a JaMSession at our studio and taste this wine as part of our Napa flight for the full JaM Napa experience. 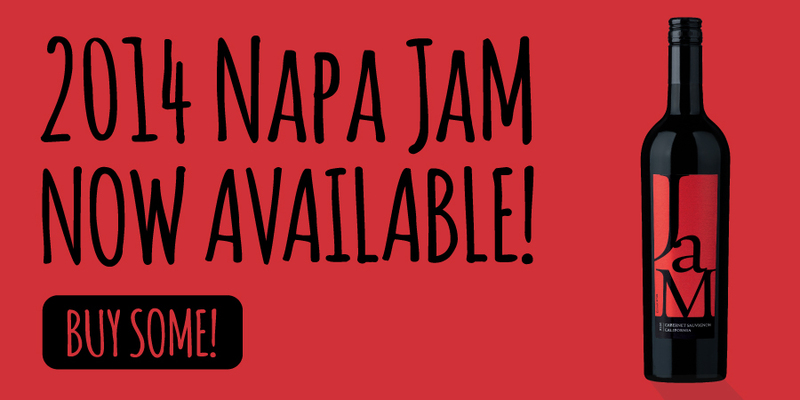 Or make your own JaM night at home—grab a bottle or two of JaM Napa here and tune into to JaM Cellars on Spotify. As always, you save at least 33% on ground shipping when you purchase any case of JaM wines, so go ahead and stock up before time runs out! It’s hard to let go of summer, but we’ve cried enough and we’re ready to move on. And fall was right there waiting for us, cozy sweaters, fuzzy socks, pumpkin spice and all! Thank you fall for…. 1. EARLY NIGHTS. Shorter days means wine o’clock comes earlier! 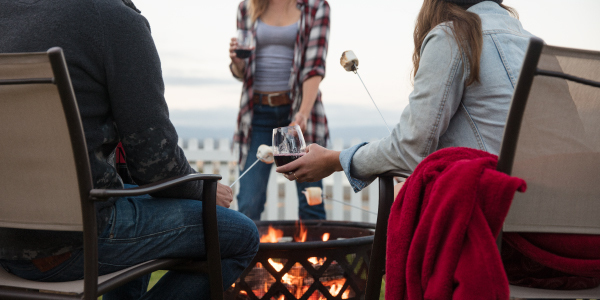 When it’s really too cold for JaMming by the firepit, there’s Netflix’s fall lineup to pair with your favorite easy-to-love wine. Did someone say Jaws marathon?? 2. RED, RED WINE. 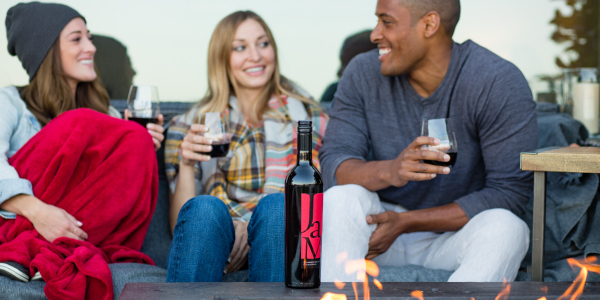 Come home to a dark, rich and luscious glass of JaM Cab to wine down on a cool autumn night. Light the fire and a couple candles and sink into the sofa…you deserve it. 3. FOOTBALL. Whether you’re a die-hard fan or only there for the food, football season brings everyone together. The conversations in the kitchen are just as much fun as the ones by the TV! We can’t decide whether we like Butter or JaM better with this three-cheese queso dip…guess we’ll have to try them both again. Hate it when that happens! 4. SIP' N' SMORE. S’mores are one of those things that help ease you out of summer into fall. Check out our nine favorite recipes for s’more inspiration this fall. We tested them and each one tastes just a little better with JaM wines, of course. 6. FALL COLORS. The leaves will be changing color in the vineyards soon, blazing with JaM red and Butter yellow—the ultimate fall colors! Grab a few bottles and head somewhere to take in the fall foliage this year. Here are a bunch of great online tools and even an app to plan your leaf peeping. It’s an excellent excuse for a visit to JaM Cellars and taste our new JaM Cab Napa. Use crunchy peanut butter instead of (or in addition to) the chocolate. Wine: Butter Chardonnay or JaM Cab – you cannot go wrong with this one. Swap in Nutella for the chocolate, and add a few pieces of sliced banana. It’s amazing. Trust us! Add cooked bacon and a dash of hot sauce. YASSS! Dark chocolate truffles, peppermint marshmallows, and organic graham crackers. Wine: JaM Cab Napa, of course…. Swap in coconut marshmallows, and use a snack size Mounds bar instead of plain chocolate. Bonus points if you use a split macaroon instead of the grahams! Add your favorite pumpkin butter (we love TJ’s – only available in the fall!) to dark chocolate, cinnamon graham crackers, and classic toasted marshmallow. Swap in your favorite shortbread – Keebler Fudge Stripes, anyone? – or any kind of buttery cookie for the graham crackers. Slip a Rolo or mini-Reese’s (or Thin Mint or whatever tiny candy you have) into the middle of the marshmallow before you toast it. The ultimate in gooey goodness! Wine: Butter, JaM or Toast, depending on the stuffing.